Purchase this product and earn 125 RC Points! This is the UltraPower Dual Port Charger. This is the newest version which has 12Amps and 120Watts of power per port. This new version also supports charging LiHV batteries. 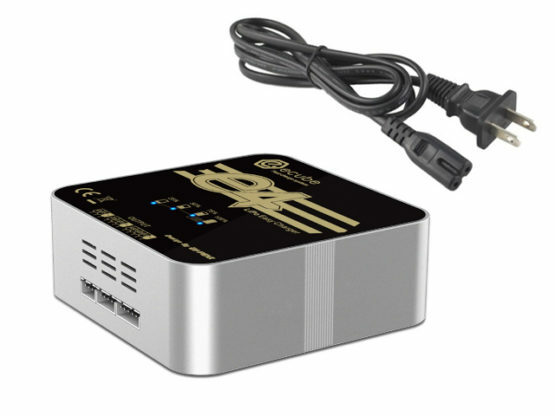 It is compatible worldwide with its built in AC Voltage switch. The USA uses 110V wall outlets while other countries may use 220V. 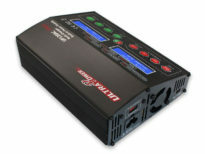 It can also be powered by DC power, allowing it to be used out in the field when a wall outlet is not available. It has 2 independent charging ports. 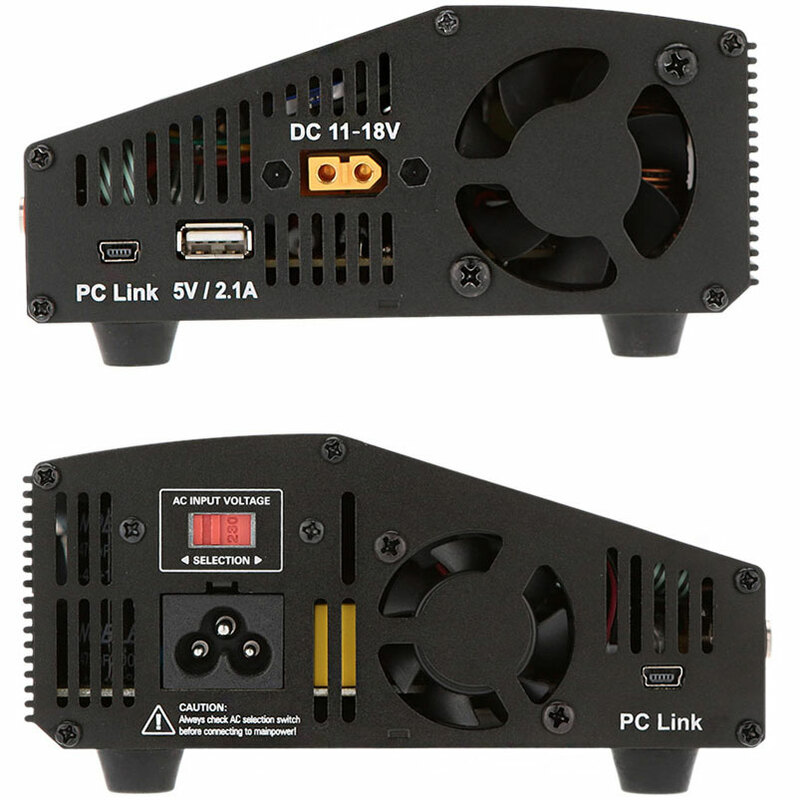 They are both capable of 120Watt and 12Amps max output. The built in power supply provides enough power so that you can use each port at its maximum output simultaneously. 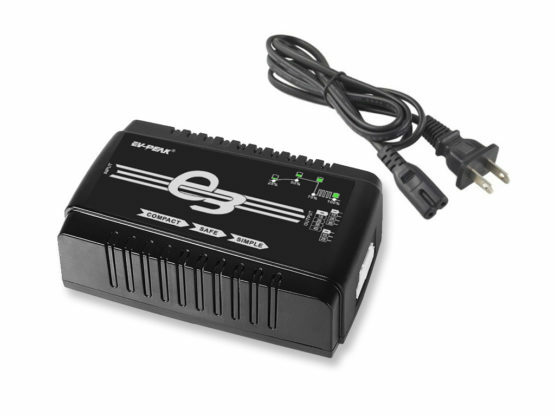 The charger can also be used as a power supply to power other devices, up to 300Watts! 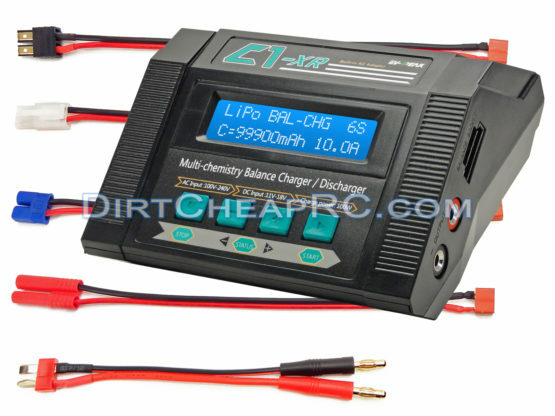 It’s a multi-chemistry charger so it can properly charge LiPo, LiHv, LiIon, LiFe, NiMH, NiCd and Pb (lead acid) batteries. It has a built in Balancer for Lithium type batteries. Each port has its own dedicated power, screen, buttons, 4mm output ports, balance port, temperature sensor port, and PC link port. As an added bonus, the charger has a 5V 2.1A USB port built into it to power and recharge your cell phone, tablet, etc. Charge two batteries at once, even if they are not the same chemistry, voltage, or capacity. This charger has 2 individual charge ports and plugs directly into the wall. 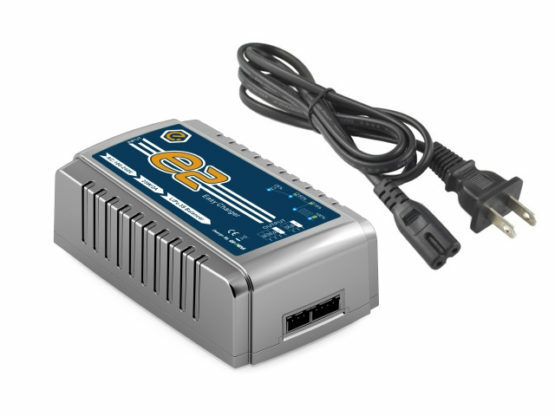 It also can be connected to a DC power source such as a 12V car battery or a DC Power Supply. The charger is quite compact at only 180x139x60mm (7×5.5×2.4 inches). So it can store away in your pit bag or box quite easily! 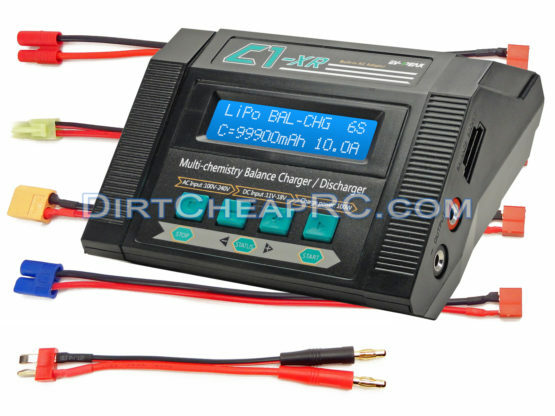 The Charger also features LiPo Balance Charge, LiPo Fast Charge, LiPo Storage, and LiPo Discharge modes. This charger can charge the latest type of Lithium Batteries on the market, LiHv! 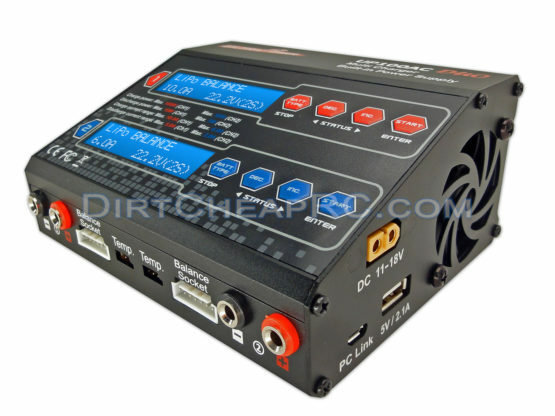 The charger can be used to power other DC devices such as chargers, lathes, lights, etc. It puts out a whopping 300Watts of power! Simply plug the charger into the wall and use the DC port on the right side of the charger to power your device. UltraPower is known for their great reliability. 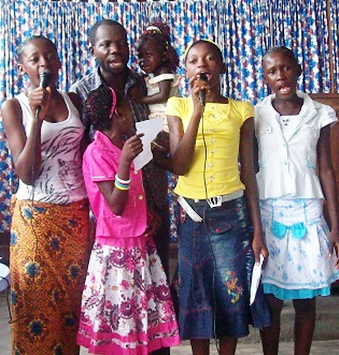 They use the best internal components and circuitry available to create long lasting products. Their reliability rivals that of name brand manufacturers such as Hitec, Duratrax, Traxxas, etc. And all this is backed by an easy 1 year warranty! This charger boasts 240Watts of total charging power! 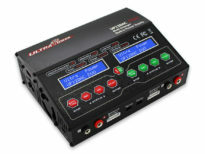 Most chargers such as Duratrax only offer 40Watts per channel. Some may even offer 50Watts. But this charger leaves them all in the dust, allowing your packs to charge faster! 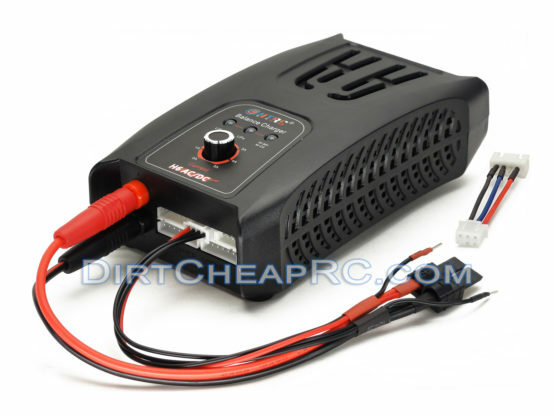 It offers a high 12Amp charge rate. Check the voltage of a Lithium battery’s cells when plugged into the balance port. The screen will provide a readout of each cells voltage, the total pack voltage, as well as the highest and lowest cells. 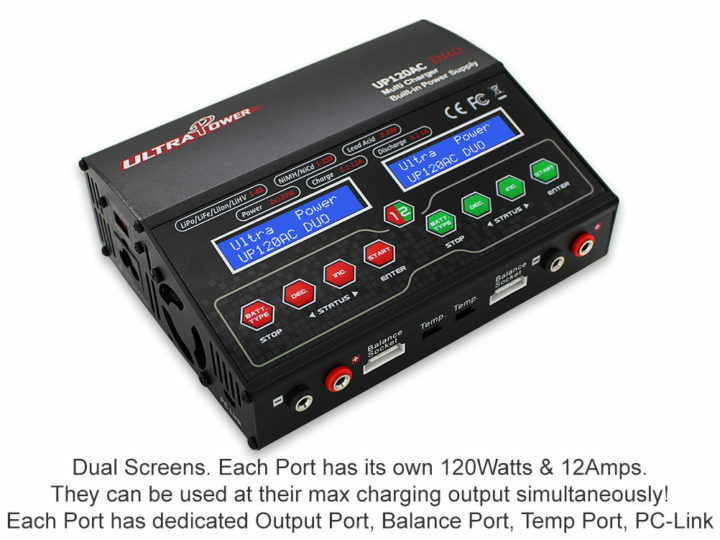 UltraPower offers a great 1 Year warranty on their chargers. This warranty covers manufacturers defects. This warranty does not cover end-user misuse or abuse. In the event of a repair/replacement the customer is responsible for shipping the unit to us in NY, while we will cover the cost of shipping the unit back to the customer. Out of the 20 chargers I own this one is hands down the best for the money that I have ever purchased including my Thunder power chargers. Tons of features, 20 battery memory, dual cooling fans and much more. Love this charger. This charger works great and has a ton of options. It works with either AC or DC power. It charges all different types of batteries and has 10 programmable memories per side. That is a total of 20 memory programs. It even tells you if you are ‘undercharging’ your battery. It has storage mode and balance mode for LiPo. This is a quality product at an affordable price. I recommend this product. I just received this product yesterday and it is a GREAT charger! This is a fantastic charger. 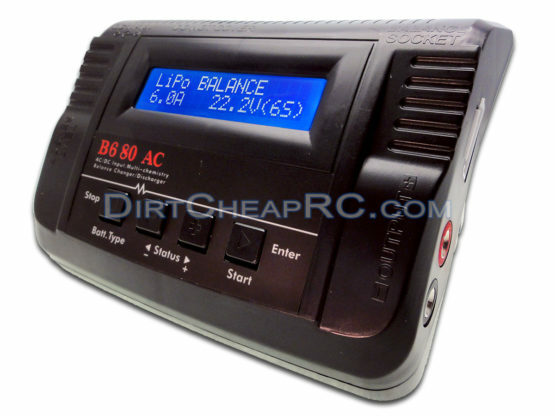 It includes a basic LiPo charging/balancing instruction cheat sheet along with the more detailed instruction manual. I received really fast shipping. It came well packaged and even included instructions from the seller and contact numbers and emails for support. I will do more business with this seller. This product is better than the one I paid 45% more for. It is the right item, right on time. 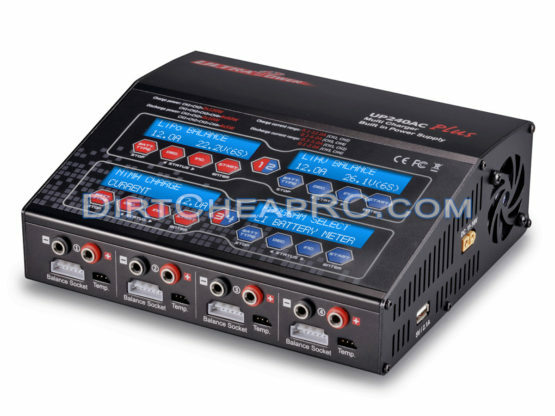 I bought this with the GTP1006 XT60 charge cables too. These are great items. I am very happy with the charger so far. I’ve only used it a few times, but have found it very easy to use. It seems to charge quicker then my other charger. I really like having 2 displays so I can see what each battery is doing without touching anything. The only negative is the beeper when the charging is done. The volume isn’t very loud to let you know that the battery is charged. I looked but didn’t see any way to adjust for higher volume. This is a fantastic charger. Thank you Dirt Cheap RC. So far so good. Of course I have only used it for about a week. Seems to charge very effectively. It seems to stay rather warm in idle mode when no activity is going on. I have to unplug it in between charges. My last charger (not this brand) stopped displaying correctly after about 8 months. So now, I unplug it in between charges. I will review this charger again after a period of time. This product arrived on time. It is a very excellent charger. This is an excellent charger. It works great with my 4S LiPos. Thank you for the fast shipping. This is a very good charger for the money. It is very easy to use. I haven’t had a problem with it so far. Dirt Cheap R/C has always provided me with ultra fast shipping and quality products. The charger is so great! I’ve been charging 10000mah on the Hitec X1, which usually took three hours. It feels like I got a dual nuclear reactor running now! 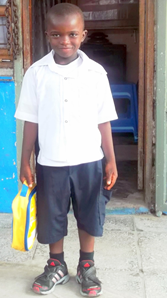 I am very happy with your product! I just wanted to personally say thank you! I just love this charger. It’s so precise. I purchased this charger because you can charge 2 batteries at once. It also shows you what each channel is doing. I love it. I also received fast shipping. The main use of this product is harvesting 18650 cells. I have been using 4S1P balance charging (40 cells) and 1S1P charging (10 cells). 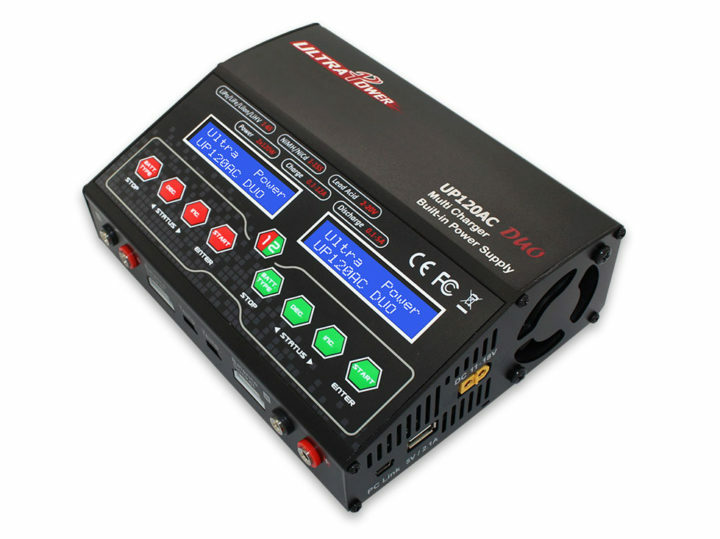 The LiIon 10amp charge rate, 10 18650’s in parallel charges around 5-7 amps when the batteries are depleted. The batteries get closer to a full charge. The charger automatically drops the charging amp rate. Wow, this is my 1st smart balance charger and I couldn’t be more impressed with its value. This seems like a decent charger with decent output for charging 6S batteries. This is a great product, really. The charger works perfectly as described. It works great. I love it really. Thank you guys! I haven’t owned it very long, but so far it has done as advertised. I bought this to para charge my group of 5000 mAh 2s. I can para charge 2 at a time, each side. It is faster then my old Duratrax 245 which can do 1 per side. It has a nice heat sink on the back and a good fan blowing out the side. It has all the options you could want for your batteries. For example, it has balance, fast charge, storage, cycling, and discharge. Also, it has the ability to run temp sensors, and pc app. It also charges 5V devices such as mp3, phone, and tablet at 2.1 amps. 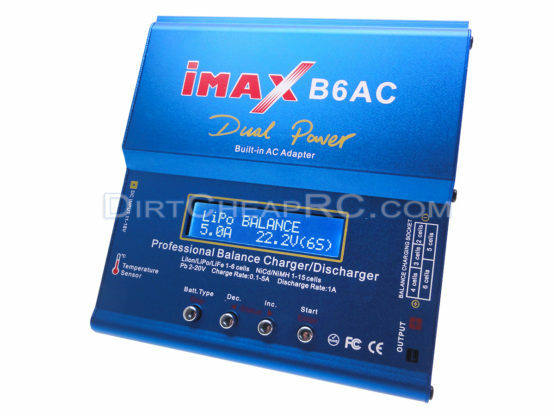 It has the ability for you to fine tune your end points, discharge voltage, charging voltage. etc. This charger has a lot of the options of high end chargers, and double the output of low end devices. If it holds up over time I will certainly consider buying another. The Barn Floor called the same day it was ordered, upgraded our shipping for free, and had it in the mail that same day. I was very pleased to have the quick attention and response, and not just another lost soul in some mega warehouse. 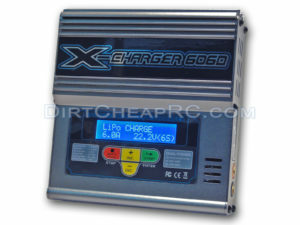 I bought this charger along side a Vant battery from Dirt Cheap RC. I have to say that I’m satisfied with both products! 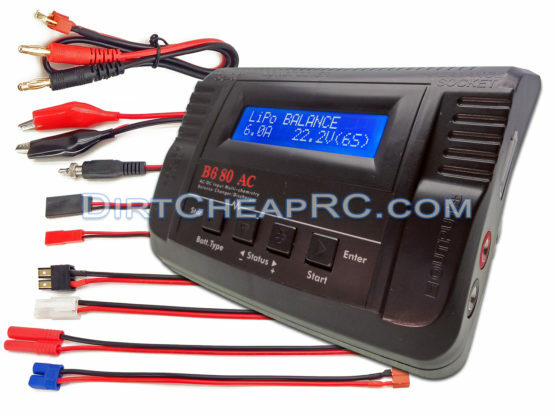 Dirt Cheap RC is a great seller with fast shipping. Really good charger. Great price. Fast shipping too. Thanks Dirt Cheap. It works great! I’ve been using it for a few weeks now. Very nice.